Iraqi forces seized a damaged Mosul bridge on Monday which could link up their units on either side of the Tigris river, as thousands of civilians fled the fighting for Islamic State’s remaining stronghold in the west of the city. U.S.-backed army and police units advanced through populated western districts, fighting tough street battles, and announced they had captured Mosul’s southernmost bridge. Once repaired, the bridge could help bring reinforcements and supplies from the eastern side, piling pressure on the militants dug in the western side among 750,000 civilians, reports Reuters. If they defeat Islamic State in Mosul, that would crush the Iraq wing of the caliphate that the group’s leader Abu Bakr al-Baghdadi declared in 2014 over parts of Iraq and neighboring Syria. The U.S. commander in Iraq has said he believes U.S.-backed forces will recapture both Mosul and Raqqa – Islamic State’s Syria stronghold – within six months. Since government forces broke through the city’s southern limits on Thursday, more than 10,000 civilians have fled Islamic State-held areas, seeking medical assistance, food and water, Iraqi commanders said. About 1,000 civilians arrived in the early hours of Monday at the sector held by the Counter Terrorism Service (CTS), the wounded taken to the clinic of this elite unit, while men were screened to make sure they are not Islamic State members. Among the people treated at the CTS clinic was a little girl with a blood on her face and a woman with shrapnel in her hand, lying immobile, apparently unconscious. An old man who came with them said about 20 people were sheltering in their house when it was hit by an air strike two days ago in the southwestern Maamoun district. Those who managed to escape have had to walk through the desert for at least an hour to reach government lines. 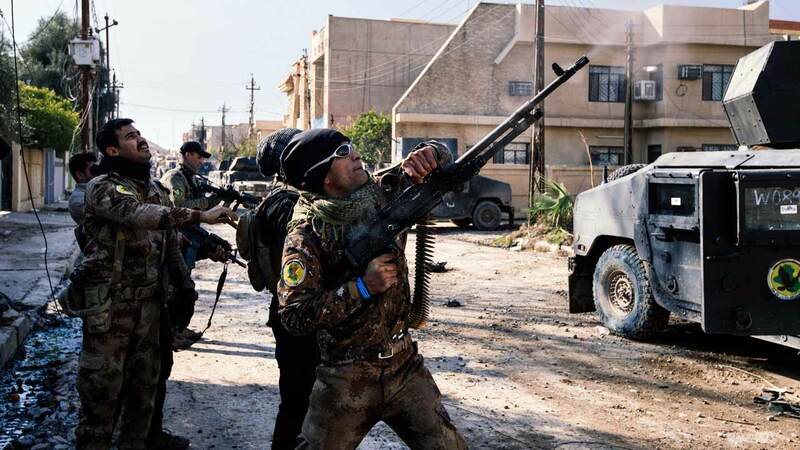 Several thousand militants, including many who traveled from Western countries to join up, are believed to be still in Mosul, prepared for a fierce standoff amid a remaining civilian population of 750,000. The United Nations World Food Programme said on Monday it was extremely concerned about dire humanitarian situation facing families in western Mosul. A Reuters reporter saw several trucks teeming with people, lifting columns of sand and dust as they drove away from the city. One had two women and infants riding in the cabin. The rest stood on the open bed, held on to the truck from outside, or sat on top of the cabin. “They booby trapped our homes and our cars,” said an old woman. A Western volunteer medic at the CTS clinic said a boy with a gunshot wound that shattered his knee was among those treated on Monday, and a pregnant woman who had both legs amputated. “Most of those who arrive to this point are hungry and thirsty and suffering neglect, and need medical care,” CTS Brigadier General Salman Hashim told Reuters. Army, police, CTS and Rapid Response units forces attacking Islamic State in west Mosul are backed by air and ground support from U.S.-led coalition, including artillery fire. U.S. personnel are operating close to the frontlines to direct air strikes.